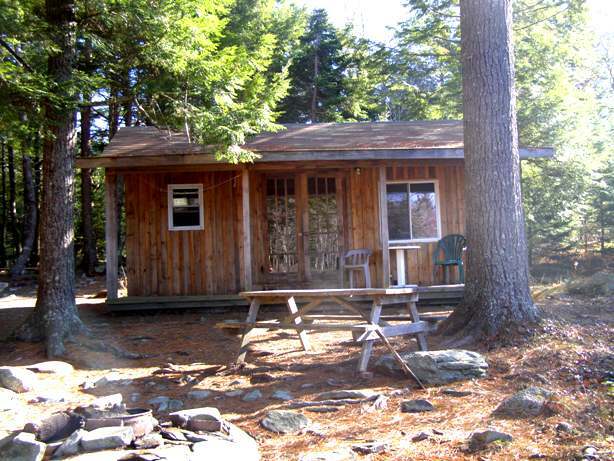 Bear Falls has one RUSTIC cottage located right on the bay of the Medway River, faceing upstream for amazing sunsets. It is quaint and perfect for a romantic getaway. This is a camping cottage, so if you like staying at Buckingham Palace, this is not your place! As Mr. Alexander Keith said, those who like us, like us a lot... but its not for everyone. The guest cottage is a camping cottage and includes electricity, lights, ceiling fan, double bed and pull out couch, table and chairs, a tv/vcr and a selection of free movies. Outside there is a gas barbeque, fire pit and picnic table. The cottage does not have indoor plumbing, but a clean outhouse is about 200 feet away. You will need to bring the basics required for camping, including cutlery and eating/cooking utensils, and bedding. Come stay for a weekend, sit on the porch, have a glass of wine, watch the river flow by, and experience an amazing sunset. You'll have memories that will last a life time... really !! Nightly: $80 for 2 people, $5 for each extra person, 4 people maximum. Nightly: $60 for 2 people, $5 for each extra person, 4 people maximum.